This month's Vampirella illustration was drawn by comics artist, Jae Lee, and shows Vampirella with Dracula and two of his concubines. Vampirella is not actually present in the room - that is just an image of her that Dracula has conjured, which is why her head is slightly translucent. Well, once again, I have had an incredibly busy month. I have finished painting the heroes from the first two factions for my Rum and Bones game - the undead Bone Devils and the English pirates, the Wellsport Brotherhood. I hope to review them soon. They were a lot of fun to paint and very different from what I normally paint. I've been buying some more figures for Shadows of Brimstone - heroes and monsters and I have a bunch of them on my painting desk right now. With me concentrating so heavily on my Judge Dredd Miniatures Game campaign, Shadows of Brimstone has taken a back seat for the moment but it is not totally forgotten about. Speaking of JDMG, I have finally managed to buy all of the figures for this range that Warlord Games had on general sale. eBay has been a huge help, and I certainly haven't paid over the odds for any of the figures I have bought from there. Indeed, many of them were cheaper than Warlord Games' recommended retail prices. The last set that completed my collection was the boxed set of 5 Judda, which I got for under £20, making it much cheaper than the RRP. It feels really amazing to have such a complete collection. Coupled with my already existing huge collection of sci-fi figures, the sky is the limit for what I can do in my JDMG campaign. A new batrep is in the offing, which will see the introduction of a new member to Judge Scott's team - PSI Judge Justine Devereux. I have had a few requests to add a female PSI Judge to the team, so I hope she'll prove a worthy asset. Judge Scott will be assessing her performance. One game in particular has really captured my imagination this past month and that is N.E.W. the sci-fi role-playing game by EN Publishing that uses the What's Old Is New rules. 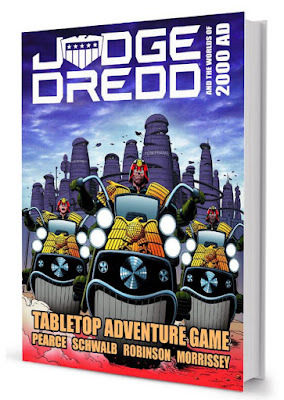 I bought it mainly to check out the rules prior to the launch of the Judge Dredd & The Worlds of 2000 AD Tabletop Adventure Game. But I became so enamoured with N.E.W. that I have decided to start a new sci-fi campaign using many of the player characters from my old and very long-running Space Opera campaign. I have converted the stats for the all female crew of the scout-ship The Ace of Spades and also created some new ones. I have charted out the star system the game will start off in - it's centred around our planet Earth. What I particularly love about this game is that it shares the complexity of GURPS but the rules are much more simplified. It very much focuses on character development, giving each PC a living story that makes them jump off the page. These heroes are far more than a set of numbers and stats. They live, they breathe and they have backstories. I love it! Indeed, I can foresee WOIN becoming my all time favourite role playing game and my "go to" set of rules for any RPG campaign I run in the future. The game has also had me doing two things I never thought would happen to me. First up, I have actually sculpted some new 28mm scale figures this month. Unbelievable! I thought my sculpting days were long gone, but sometimes you need a certain figure that no-one else sells. Sure, I still do lots of converting, but that is not the same as sculpting a figure from scratch. The figures are finished but not yet painted. I'll review them later. Secondly, I have started collecting miniature starships to use in small scale ship to ship combats. 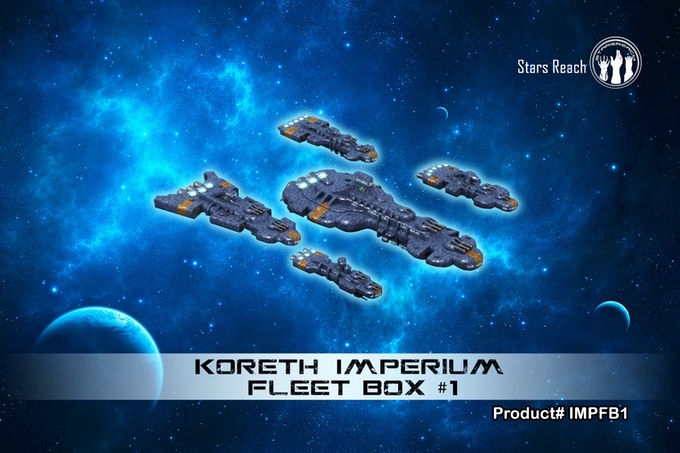 I have started with the excellent, and very cheap, set of 12 plastic starships sold by EM4 Miniatures. Twelve ships for just £2.55 seemed like a great place to start, and best of all, they're all different. 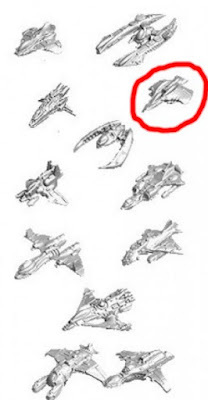 That's them to the right, and I've circled the ship I'm using for The Ace of Spades in red. For those of you wondering (Simon, I'm particularly thinking of you!) I do not plan on collecting any Star Trek ships, or any Star Wars ships, or rules sets for either franchise. The ship to ship combat rules in N.E.W. are simple enough for my needs and what I especially like about them is that most PCs on a ship has a role to play in the combat. However, I did succumb to a new Kickstarter that opened earlier this month - Stars Reach pewter starship miniatures by Twilight Game Designs. 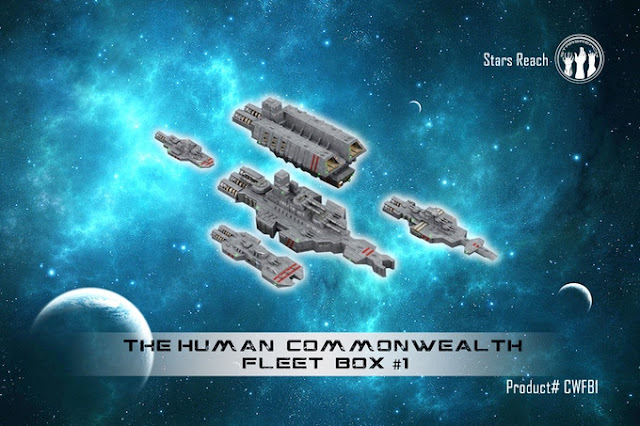 Here's the link to it - https://www.kickstarter.com/projects/twilightgamedesigns/stars-reach-space-ship-miniatures/description The ships in all three factions, but in particular, the Human Commonwealth ships, greatly appeal to me and fit in well with my plans for my N.E.W. campaign. Check out the pictures below if you don't want to click on the link. An unexpected bonus for backing this Kickstarter is that Ed, from Two Hours Wargames, is offering a free PDF of the 5150: Star Navy rules to anyone who makes a pledge for all three factions. I did and Ed has already honoured his promise. THW is one of four companies actively supporting this project, although the factions will be renamed for use in 5150. I will actually be renaming the factions for my own upcoming campaign. I have never played any starship combat games before, so this is something I am very much looking forward to but I suspect in my N.E.W. campaign The Ace of Spades will do more running and hiding than actual fighting. That said, for its size, it is well armed, well armoured and has a cloaking device fitted, which will prove extremely useful in keeping it hidden. I suspect that May is going to be an even busier month for me. I hope so because I'm feeling incredibly well right now. If I could bottle my mojo I'd make a fortune! Thanks for reading and take care. The last time I posted anything about 7TV2e was to review the Crooked Dice cameraman and television (see here - http://vampifansworldoftheundead.blogspot.co.uk/2016/07/7tv2e-cameraman-and-tv.html ). Both myself and a few others suggested it would be nice to see figures of other TV crew members. When I saw that Wargames Foundry had the following Film Crew set for sale on their website, I knew I had to buy them. These are just perfect to use with the 7TV2e game. At the far left is the director. In such a male dominated profession, it is very unusual to see a female director. She is a nicely posed figure. I deliberately painted the T-shirt of the guy standing next to the director with an orange and white colour scheme featuring the 7TV logo. He could fill numerous roles - a composer, director of photography, gofer, lighting director, producer, sound engineer, special effects guy, stunt co-ordinator, etc. It's a long list and he is so generic he could fill almost any role in the film and TV industry. The next three figures are all wearing flak vests, suggesting they are filming in a war zone or somewhere where danger is present. In the centre of the group is the attractive female reporter, making sure her hair isn't out of place. Second from the right is the cameraman and he's operating a hand-held camera, so he can get right in close to the action and track it whilst on the move. Finally, is the sound engineer, holding his large boom microphone above his head. It is no surprise that his arms are so muscular. These are delightfully sculpted figures. It would be interesting to see stats for them to use in 7TV2e in much the same way as Crooked Dice Games did for their cameraman. I'm going to be reviewing some more of my contemporary figures over the next couple of weeks, but my JDMG campaign has not been forgotten and I am prepping the next scenario right now. Kleggs are most famous in Mega City One for their use by Chief Judge Cal in suppressing the rebellious population through sheer terror. However, Kleggs are known throughout the galaxy for being particularly vicious mercenaries. Willing to fight for anyone, they demand nothing more than fresh meat from their employers who will usually supply this from the enemies the Kleggs are crushing. It is an easy arrangement that suits both parties. These mercenary bands roam the galaxy, looking for anyone disreputable enough to hire them. When business grows thin, they will quite happily invade a town, city or world on their own time, terrorising the local population before eating them. This is when the mercenaries become an invasion force. The Kleggs rarely stay long on any world as they pay keen attention to mounting resistance, usually departing when their prey receives reinforcements and the fighting gets serious. Kleggs enjoy a good fight as much as the next alien, but they much prefer to hunt down helpless prey than trade shots with heavily-armed and well-trained soldiers. Most Kleggs are not blessed with an over-abundance of intelligence, but among them are the ruling high caste, Kleggs bred for their ability to think their way round problems, and fine-tuned with an education centred around military conquests. 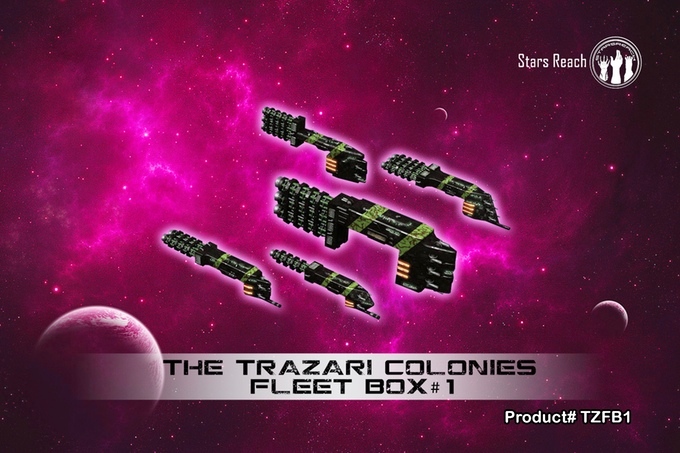 The presence of one of these can make a Klegg invasion force much more terrifying. All of the figures I'm showing here were produced by Warlord Games for the Judge Dredd Miniatures Game and the stats for a Klegg invasion force can be found in the Blood on the Streets supplement (see page 114). 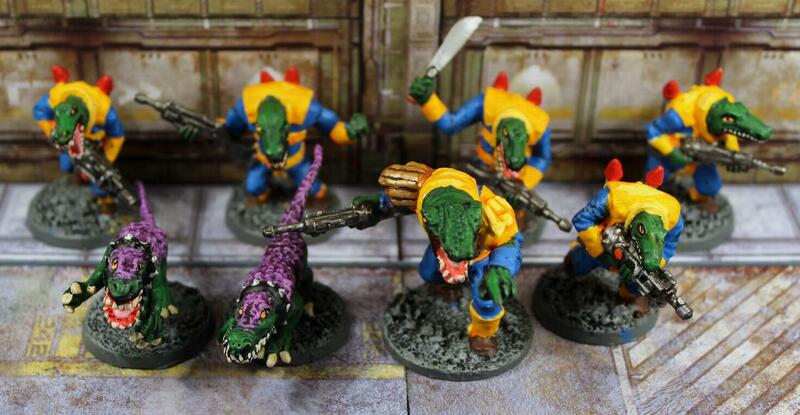 Wherever a Klegg invasion force appears, you can be sure the vicious Klegghounds will not be far behind. Gifted with an incredible sense of taste that allows them to track targets for miles, Klegghounds are adept at bringing down prey. These figures were cast in three parts - body, head and right arm. In JDMG they are Level:0 Illegal Infantry Minions with three Special Rules. First is Klegg Master. You may only field as many Klegghounds as you have Kleggs in your force. A Klegghound may never move more than 12" away from a Klegg and if one finds itself further away, it may only make Move actions until it is within 12" again. Second is Nasty Bite, a melee attack that does 2 Damage with AP-2. Third is Sense of Taste. Few can hide from a Klegghound. The Klegghound will negate all Sneaky Does It Talents in the opposing force with the exception of The Shadow. A Klegghound costs 100 Credits to hire. Grampus was the leader of the large Klegg invasion force that Chief Judge Cal employed to keep the streets of Mega City One clean. After the death of Deputy Judge Fish, Grampus was awarded the position in recognition of the work the Kleggs had done in bringing the entire city to heel. This awe-inspiring and imposing figure at the far left is much taller than all of the other Kleggs as befits such a member of the ruling caste. He is a Level:4 Illegal Infantry Hero, equipped with a Heavy Spit Gun and a Shell Jacket. His five Talents are Careless Charge, Dirty Fighting, Skilled and Deadly, This Is My Bite and Thundering Charge. He also has two Special Rules - Nasty Bite (as detailed above) and Ruling Caste, which allows all Kleggs and Klegghounds within 12" of him to re-roll any failed Will to Fight checks. Grampus costs 305 Credits. Supporting Grampus are two Klegg Mercenaries armed with a Flamethrower in the centre and a Bludgeon Cannon at the far right. Both wear Shell Jackets. Both are Level:0 Illegal Infantry Minions but that will most likely change when I create their Character Record Sheets. They also have the Nasty Bite Special Rule (actually, all Kleggs have this rule). They cost 190 Credits each. 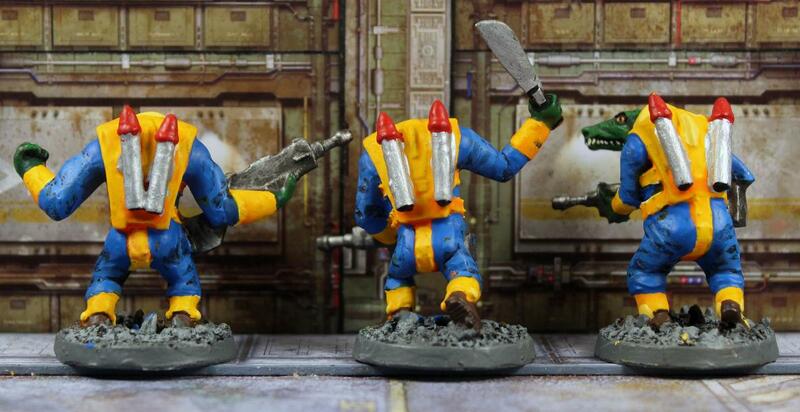 Here we have three rank and file Klegg Mercenaries, all armed with Heavy Spit Guns and all wearing Shell Jackets. Once again, they are Level:0 Illegal Infantry Minions. The Illegal classification means that Judges can attack them on sight without having to make arrest attempts first. The Klegg in the centre of this group is also armed with a Cleaver, which raises his Credits score to 200. The other two are worth 190 Credits each. 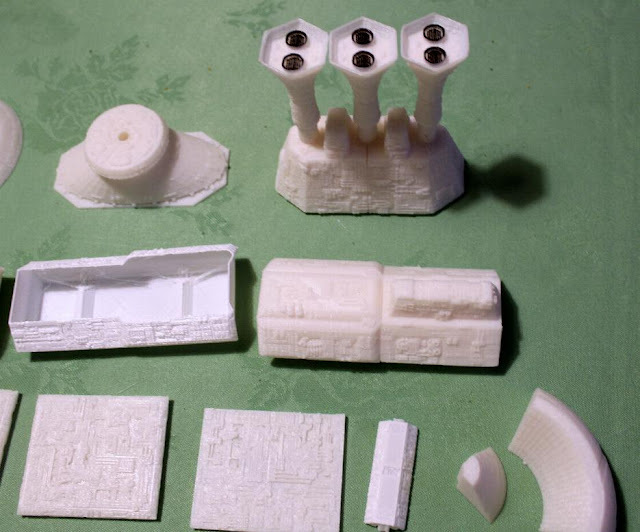 I continue with my reviews of Wargames Terrain Workshop scenery items, but this time I'm highlighting a couple of scenery pieces I recently ordered, both of which are from the Post Apocalypse range. In both cases I chose the painted options, both to save me the time in painting them and plus, they look a lot better than I suspect I could have achieved. The two items I chose were the Toxic Pool and the Crushed Car. The Toxic Pool measures 197mm in length by 126mm in width and by 15mm in height. 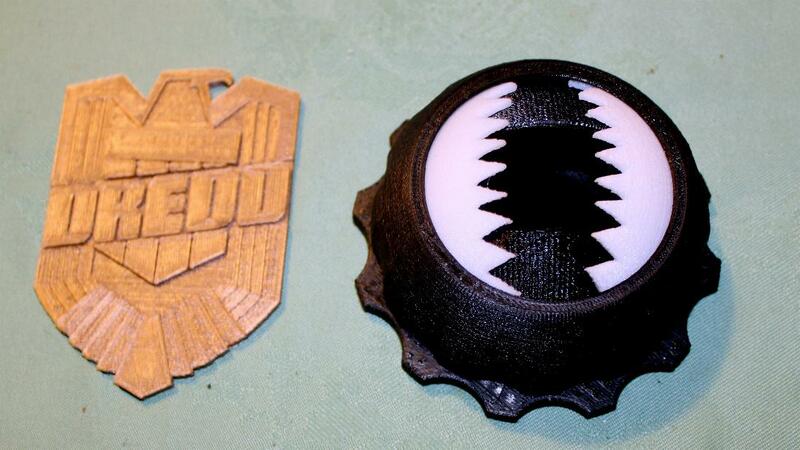 I specifically wanted it to use in my Judge Dredd Miniatures Game. Toxic Pools are a common feature of Mega City One. In addition to being a great place for dumping corpses, I thought it would make for an ideal spawning point for some Toxic Zombies. Although I ordered the painted version, which costs £12.60, as opposed to £7.00 for the unpainted version, I repainted the surrounding earth banks to match the colour scheme of most of my figures and scenic bases. 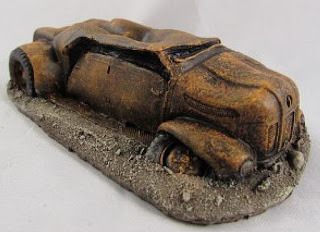 Dave Stone, who painted it, had given it a brown surround, just like on the crushed car. Note the skeletal hand and skull sticking out of the pool! A nice touch! As soon as I saw the Crushed Car model, I knew that I wanted it. Dave has done a first class job on painting it and the rust effects are just superb. 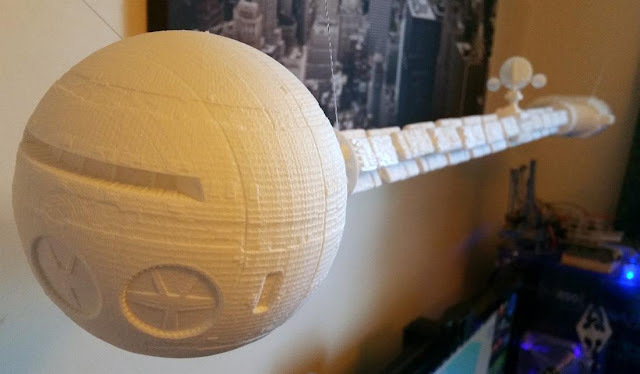 It measures 107mm in length by 59mm in width and by 24mm in height. The painted version cost £7.20, whilst the unpainted version is just £4.00. I did think about repainting the base but decided that the brown colouring complemented the rusty brown of the car, so just left it as is. I am absolutely delighted with these two items of scenery and you can expect to see them appearing in more batreps of mine in the future. What I particularly love about all of Dave's work is that they are very usable, well-detailed and superb value for money. Even his painted stuff is very affordable and often cheaper than similar unpainted products from other companies. 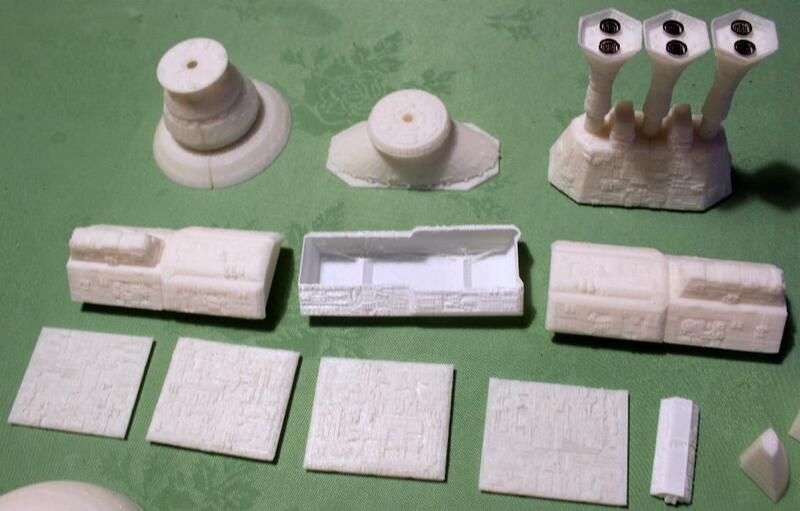 Wave 2 of the excellent Future City Scenics 28mm scale resin-cast scenery items were recently released on the Wargames Terrain Workshop webstore. Once again sculpted by Dave Stone, with a little input from yours truly, these will fit in well in any sci-fi or near future setting, but for me, they will see most use in my Judge Dredd Miniatures Game campaign. First up is a ubiquitous drinks dispenser or Soda Machine as Dave has called it on his webstore. I asked Dave for this item to be made and he duly obliged. The beauty of this item is that it can be used in a contemporary setting as well as sci-fi setting. I ordered two of them, one painted by Dave and one left unpainted. The unpainted version costs £1.50, whilst the painted version costs £3.00. Dave painted the Rad Cola machine, although I added the silver bits on the back. I had a very specific design in mind for the unpainted version. I am a big fan of Super Dungeon Explore by Soda Pop Miniatures and Ninja Division Games. Their mascot figure is Candy and her odd little pet, Cola. Soda Pop Miniatures seemed like a good name for a drinks dispenser. So using a desk top publishing program, I cut and pasted some pictures of Candy and Cola along with the SPM logo to come up with front and side images for my drinks dispenser. Then I shrunk them to size, printed them out and glued them to the drinks dispenser. I am really, really pleased with how they have come out. I now have a totally unique scenery item that I can use in numerous settings, including the fantasy world of SDE's Crystalia. I have placed my figure of Candy and Cola alongside her drinks dispenser and my figure of Judge Scott alongside the Rad Cola machine. When Dave asked me for ideas for generic scenery items for this range, I immediately suggested flying drone cameras. Dave came up with this design for a surveillance drone. I think he's done a great job in sculpting them. 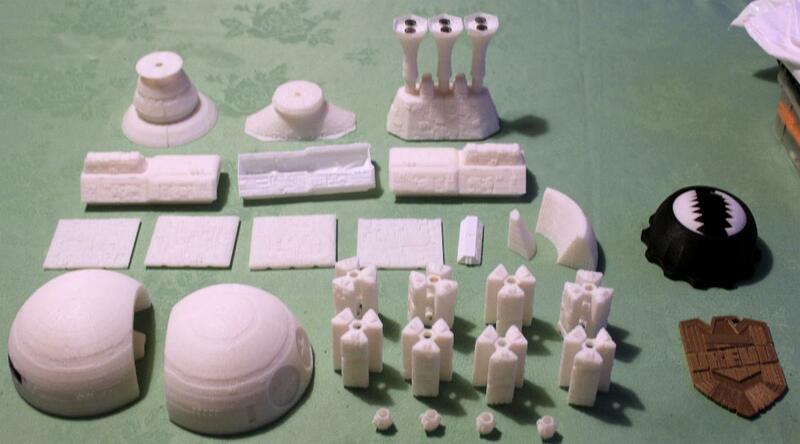 You get two drones in a pack for just £1.00 unpainted, or if you want painted versions they cost £1.80 for a pair. Please note that they do not come with flying bases or any kind of bases. Dave explained this was for a few reasons - one, it kept the price down, secondly, some people like clear flying bases, as I've used here, whilst others prefer black flying bases. 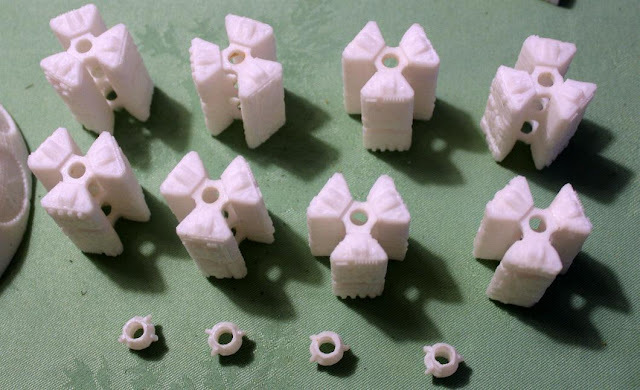 Some prefer the hexagonal bases but others prefer circular bases. I simply ordered these clear plastic bases from eBay and I'm very happy with them. In the photo above the drones are positioned from left to right with front facing, right side, left side and rear facing. 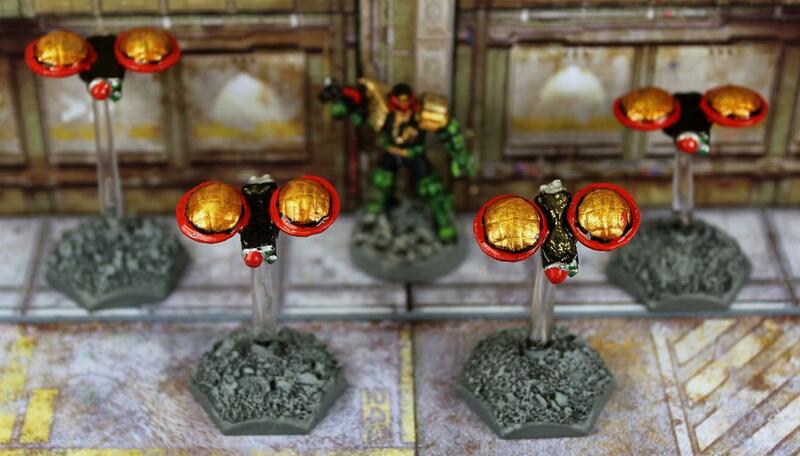 The obvious paint scheme for them would be an all-over silver, as Dave has done on his painted versions. But I wanted mine painted as Justice Department Spy in the Sky cameras, so I chose an appropriate colour scheme of black, gold, red and silver to tie them in with my other Justice Department vehicles. I mounted them on one large, two medium and one small flight stems and textured the bases. These will prove a very useful tool for my Judges. No one can hide from the Law! They're watching you! The typical view of the Citi-Def soldier is of a man who barely knows one end of a Spit Gun from the other and, pumped up on action vids on the Tri-D, attempts to live out his fantasies by joining the only military option open to citizens. In many cases this is remarkably accurate and the Citi-Def is a source of constant worry to the Justice Department, for allowing citizens legal access to weaponry surely courts disaster. A force of Citi-Def soldiers will not be the most competent in Mega City One, but they do have access to armour and heavy weapons that can make them very scary - as much to one another as any enemy! In this post, I'm going to review the first of my numerous Citi-Def forces, a small unit containing just four figures but who are one of each of the four types available to a typical Citi-Def squad. Citi-Def soldiers always belong to one particular city block and are often fanatically loyal to that block. This squad that I'm showing here belong to the Danny Glover Block in Sector 13, the location of my Judge Dredd Miniatures Game campaign. At the far left is Shane Miller, a Citi-Def Officer. The Citi-Def Officer is different from the soldiers he commands. He is not a weekend warrior living out his action-hero dreams but a career soldier dedicated to the protection of the city. It is his responsibility, as a guardian of Mega City One, to ensure his fellow citizens do not suffer invasion as they have in the past. In all likelihood, it is the Citi-Def Officer who has organised the latest block war, simply to provide real world training for his men! This figure was produced by Mongoose Publishing, as were the Med-tech and the Soldier, but they were discontinued when Warlord Games took over production of the range. Warlord Games redesigned them and increased the range from three figures to eleven. Shane Miller is a Level:3 Infantry Hero armed with a Spit Pistol and Hand Bombs and wearing a Shell Jacket. He has two Talents (Agile and Quick Dodge) and two Special Rules. Rallying Cry - so long as he remains on the table and is still alive, all failed Will to Fight checks for all friendly models may be re-rolled. True Leader - any friendly model within 15" and in line of sight of him may use his Will score instead of their own for any Will check, including resist Arrest checks. He costs 175 Credits. Standing next to Miller is Matt Kramon, a Citi-Def Soldier. Citi-Def Soldiers sign up for one of three reasons; either they are bored from their long days of unemployment, have a deep patriotic sense to defend Mega City One, or have watched far too many action-vids. They are all, however, crazy once a Spit Gun gets put in their hands. Kramon is a Level:1 Infantry Hero equipped with a Spit Gun Rifle and a Shell Jacket. He has two Talents - Aim and Suppressing Fire and one Special Rule - Trigger Happy. Whenever a Citi-Def Soldier takes a Shoot action, he must make a Will check. If this is failed, his next action must also be a Shoot action unless an enemy engages him in Close Combat before this action can be taken. If no enemy model is in sight, he will attack the closest target, be it friend, foe or innocent bystander. He costs 150 Credits. Second from the right is Ramsey Van Horn, a Jaeger Squad Commando. Not all Citi-Def units have a Jaeger squad, but those who do include such men in their ranks are often considered to be elite forces (elite being a relative term...). Each member of the Jaeger squad is a full time Citi-Def Soldier who has dedicated himself to protecting his block against all enemies. Training hard in infiltration skills and the disruption of communications, the Jaeger squad is as close to a true commando unit as any Citi-Def is likely to get. This particular figure is made by Wargames Foundry as part of their 2000AD range. Van Horn is a Level:2 Infantry Hero armed with a Spit Gun Rifle and Knife and equipped with a Respirator, Shell Jacket and Sucker Gun. He has four Talents - Infiltrator, Silent Action, Silent Killer and Stealthy. He also has two Special Rules. First is Going Commando - using a combination of Sucker Guns, rappelling lines and para-gliders, the Jaeger Squad Commando can appear anywhere unexpected. The Commando gains a Sucker Gun, allowing him to drop down a sheer surface up to 12" with a single Special action. Secondly, is Silent but Violent, which grants him the Stealthy Talent for free. He costs 245 Credits. Finally, is Dan Moxness, a Citi-Def Med-tech. Medical technicians who join Citi-Def units are never short of work, patching up patients and performing emergency surgery - usually on unintentionally self-inflicted wounds. They quickly learn to avoid the most trigger happy soldiers, but often take breathtaking risks when one of their unit goes down. Moxness is a Level:1 Infantry Hero armed with a Handgun Pistol and is equipped with Pad Armour and a Medi-Kit. His two talents are appropriately, First Aid and Medic. He has one Special Rule - Lifesaver. The Med-tech is always assumed to have taken one extra Special action on its last turn when using a Medi-Kit (so he will always count as having taken at least one). He costs 105 Credits. By no means can these be considered a major threat, although they are all classed as Heroes, which does increase their survival odds. In future posts I'll showcase much larger Citi-Def forces who are much more likely to appear in a Block War scenario. Quite possibly, the most exciting news I have read this year was this announcement from the 2000 AD website. "EN Publishing, under license with Rebellion, are developing a range of Tabletop Adventure Games and supplements based on the iconic characters and worlds found in the legendary British comic 2000 AD. The first release will be Judge Dredd & The Worlds of 2000 AD Tabletop Adventure Game, a full colour hard-cover book which contains the core ‘Worlds of 2000 AD’ rules as well as setting information enabling the players to not only play Judges, but also civilians and perps, in Mega City One. Writing and development is well under way with writer Darren Pearce (Doctor Who; Lone Wolf) working on the core rulebook alongside Russ Morrissey and Nick Robinson, with additional content from Robert Schwalb (Dungeons & Dragons; Warhammer Fantasy Role-play), whilst Andrew Peregrine (Doctor Who; Firefly; Buffy The Vampire Slayer) is writing The Robot Wars." I was expecting a long wait for the book to arrive but it came within four days of ordering it. First impressions were highly favourable. Having read it from cover to cover I can highly recommend it. My yardstick for how good a role-playing game is this, how does it compare to GURPS, my all-time favourite RPG? In so many respects, it is better. It is certainly a lot easier to learn and to play but it still has a level of detail that I love to see. So, I am delighted that Rebellion and EN Publishing have teamed up. I am extremely confident the 2000 AD franchise is in safe hands and that the new books will all be winners. This will be a much better game to play than the deeply flawed Mongoose D20 rules (superb background material but utter pants gameplay. I played it once with a group of four experienced gamers and we ripped the rules to shreds!). I was going to wrap this post up here, but something else crossed my mind. It was announced a couple of months ago that Warlord Games have acquired the licence from Rebellion to produce 28mm scale figures for all 2000 AD titles, and that they will be producing games to go with the figures. So how does this effect these new 2000 AD game-books from EN Publishing? Firstly, I suspect that the rules that Warlord Games are going to produce will be for skirmish wargamers, pretty much as the current Judge Dredd Miniatures Game is. After all, Warlord Games are a company who specialise in wargames. They are not noted for producing role-playing games. So the products from both companies should sit side by side very well with one company concentrating on the wargaming aspect and the other on the role-playing experience. Secondly, one of the WOIN developers said he was happy to promote the new 2000 AD range of figures from Warlord Games. That is very promising and I'm heartened to see one company supporting the other. Finally, what impact will the new RPG have on my existing JDMG campaign? Quite simply, none whatsoever. The JDMG campaign is here to stay. It won't be replaced when the RPG rules are released. However, I will run a separate campaign based on the WOIN rules, which will concentrate less heavily on combat and more on investigations of crimes and character interactions and development. I really am incredibly excited about these new developments. Bring it on!